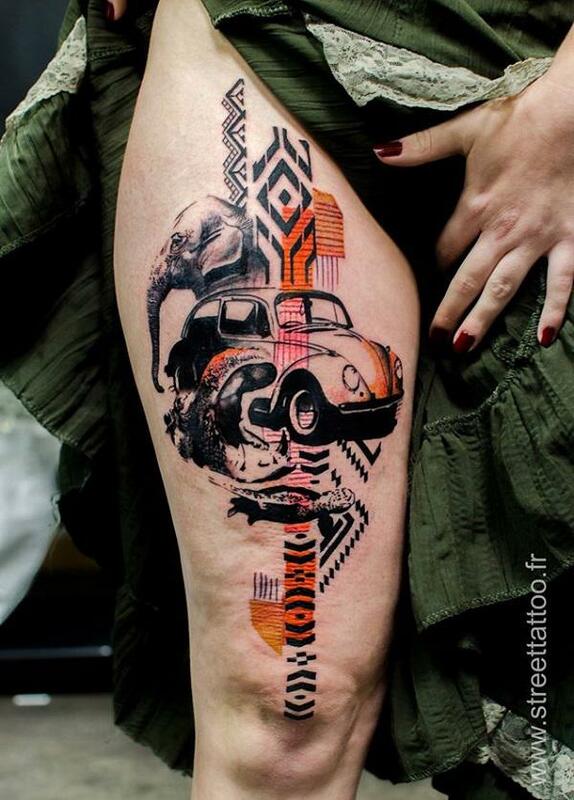 This thigh tattoo gives off a retro vibe infused with the jungle. It kinds of remind you of those cool graffiti you see on city walls. Tattoos has been around not just for years or decades; these are around for centuries and have endured ages and ages of development. Right from the designs to purpose, these continue to gain attention from enthusiasts. In the past, tribes used to ink their people for either their status in the society or what their culture has passed down on them. Now these tattoos mean more than just mere identification. More often, these are works of arts in a beautiful canvas. What you’re going to get tattooed on you should be your decision. Since these tattoos are usually permanent, you have to decide carefully what you’re going to get. Most of the times, a person’s tattoos carries stories of past or hopes of the future. Other popular decisions among enthusiasts are tattoos with hidden messages or symbols of who they are. Among the most common these days especially with women and younger people are lines and passages that kept them going through tough times of their life. A vast majority of people however go with stunning to bizarre artistic designs. After all, tattoos are masterpieces. Another thing to always think about when getting a tattoo is where you’re placing it. Somewhere visible? Somewhere only you can see? On top of a scar? Or somewhere you feel links more to your soul than anywhere else in your body. But where you’re going to place your tattoo can also determine the design of your tattoo. At the end of the day though, where you’re comfortable and what you feel speaks more of your message should be inked in your body. After getting inked, love your tattoo as it now becomes a part of you. Just a reminder though, go for a good tattoo artist YOU KNOW. This can give you few advantages, the first being that you know you are getting a safe tattoo with safe and clean equipment. 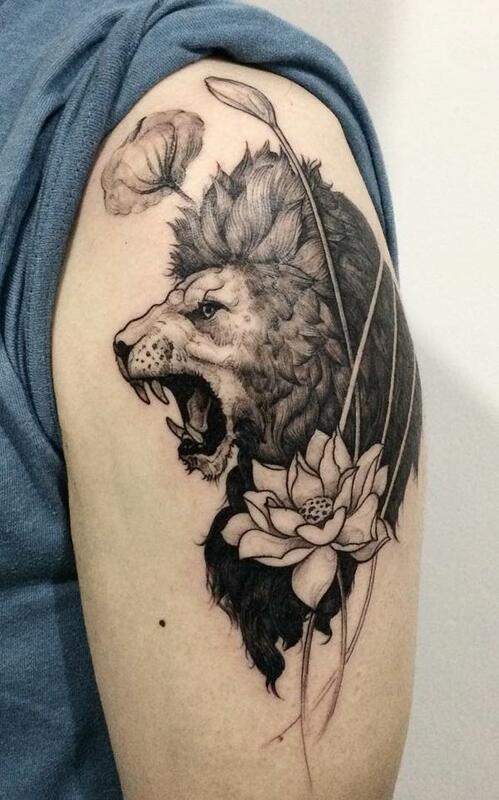 The quality of your tattoo would also be determined by who creates it. Of course if you wanted a clean looking and striking tattoo, you need an artist with good skills. Usually, those artist who have long been on the business would be the better choices. BUT don’t underestimate new artists. Sometimes mere talent and artistry could go a long way than actual experience. Only be certain that you won’t be getting problems with your tattoo in the future. 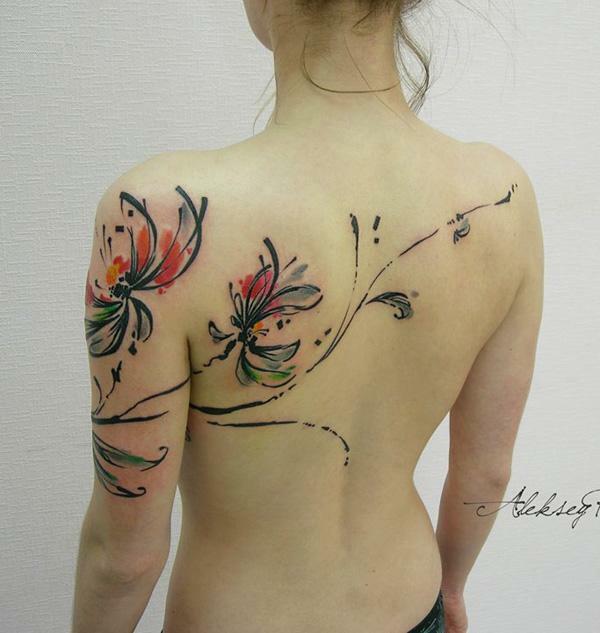 This cool tattoo extend from your arm to your back but with cool subtlety you only see on watercolor paintings. 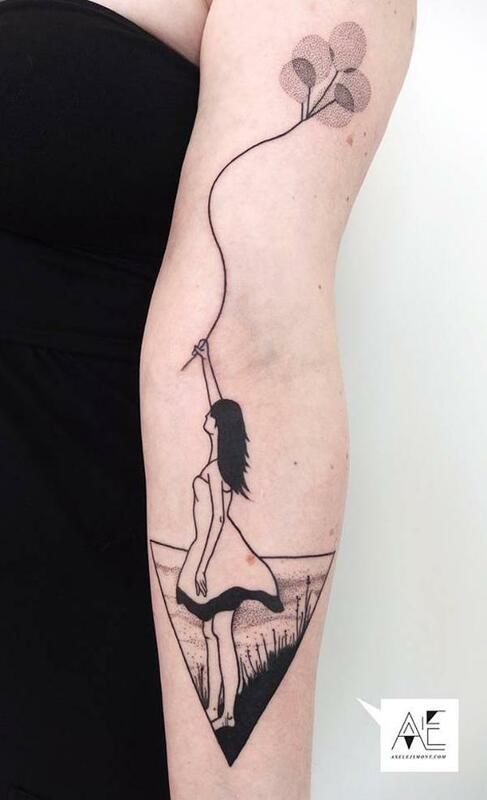 Placing it on your arm can make you show off your beautiful tattoo but the extension would make it look like you have more to showcase. If you’re a fan of watercolor paints, then you’ll definitely enjoy this. 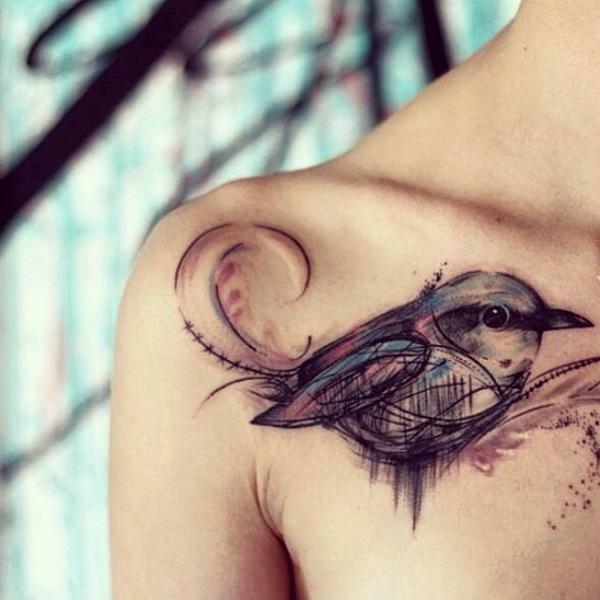 Birds as tattoos usually have meanings behind them such as a metaphor for the phases of life. Adding a bit of color to your tattoo could also make it more alive and vibrant. More than just the meanings, birds are actually stunning subjects in art. Here, it shows great intricate details which perfectly complements the surrounding flowers. 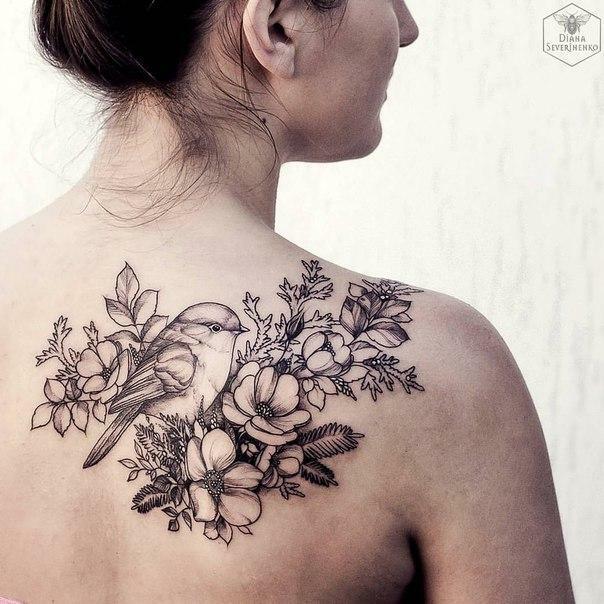 Side tattoos are also extremely popular these days especially for women. This delicate blue peacock and butterfly design could be great designs for ladies. 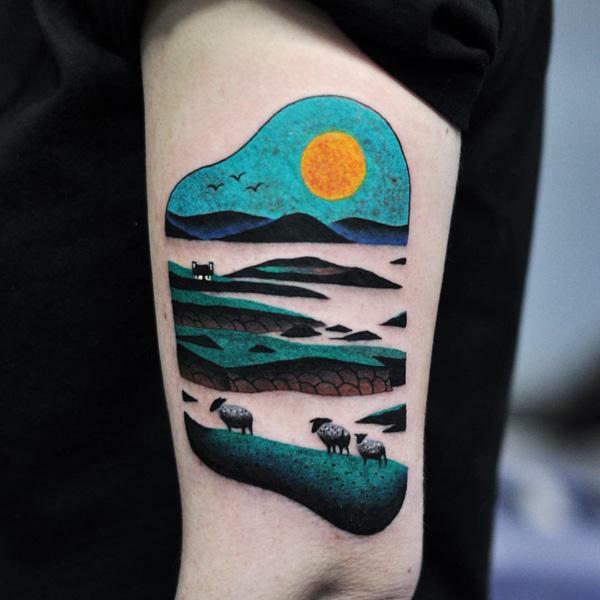 What better to wear on your sleeves than a beautiful and lively tattoo of a night beach? The colors make your tattoo pop up which could go with your bubbly personality. Or you can have it symbolize your calm and quiet personality. 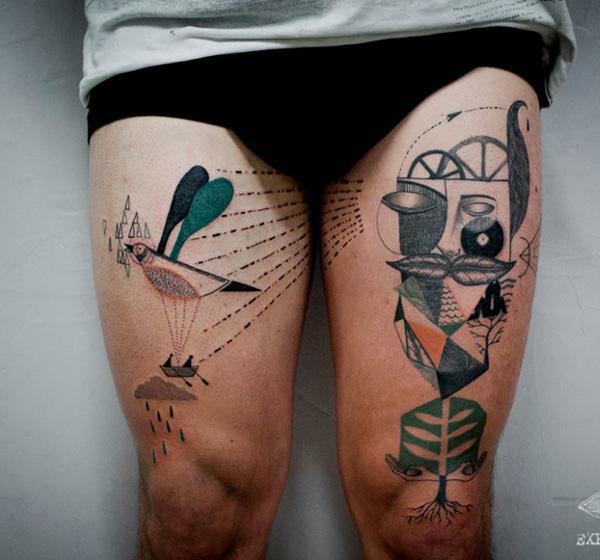 If you want to make them stop at their steps, then you can have this surreal abstract thigh tattoos. 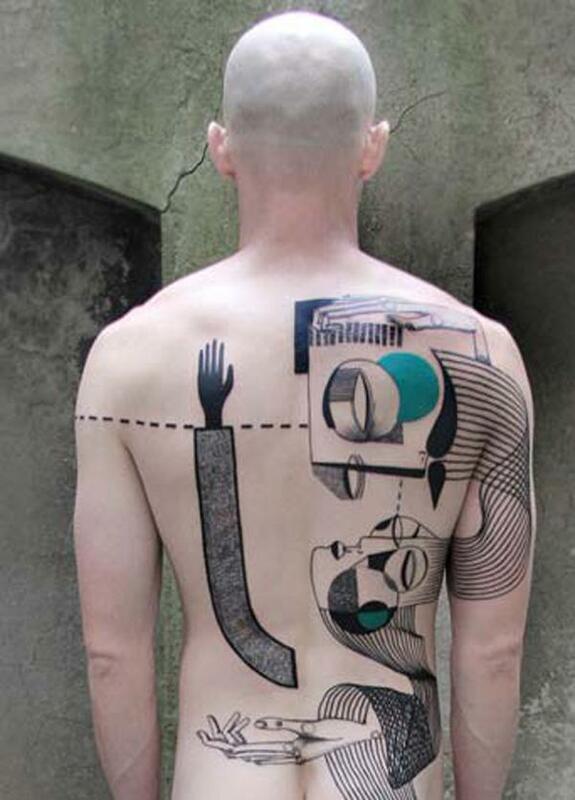 Nothing beats abstract tattoos that are bizarrely beautiful; whether or not you actually designed it to have some kind of meaning. After deciding you want to become a walking masterpiece, how about thinking of a cool design to show off? 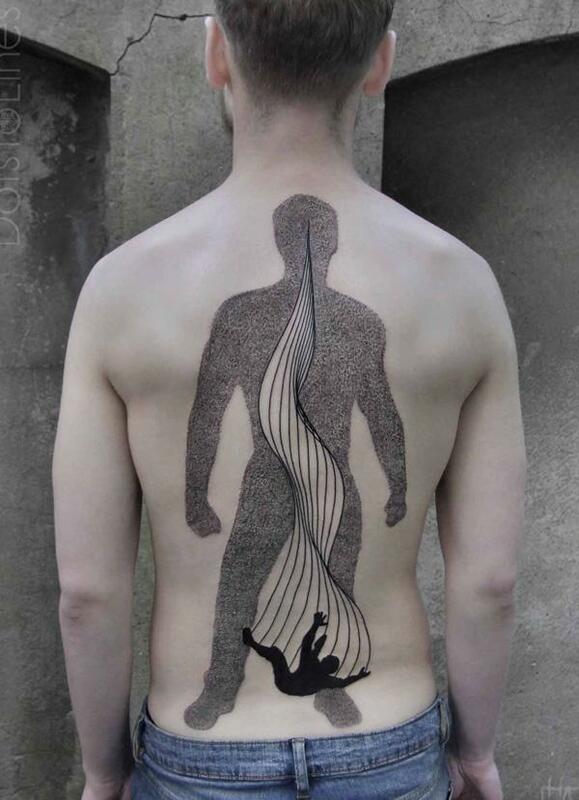 This abstract tattoo can be a perfect representation of the human psyche. Plus, the 3D effects of the waves makes it enthralling. Dream like designs work best on tattoos. Besides the mesmerizing designs, it could really represent emotions and what’s going on in your head. And the bigger plus is you don’t need whether it goes in or out of style, your tattoo would always look stylish. 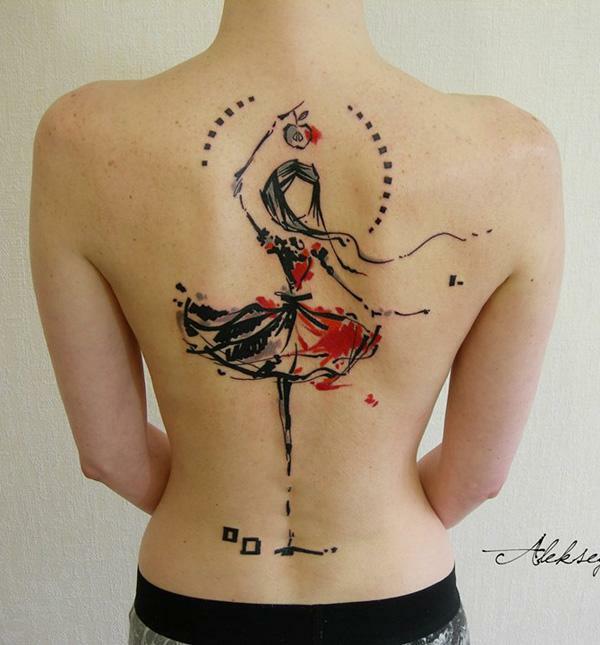 Dancing girls on tattoo often looks graceful and serene and it could symbolize exactly that. 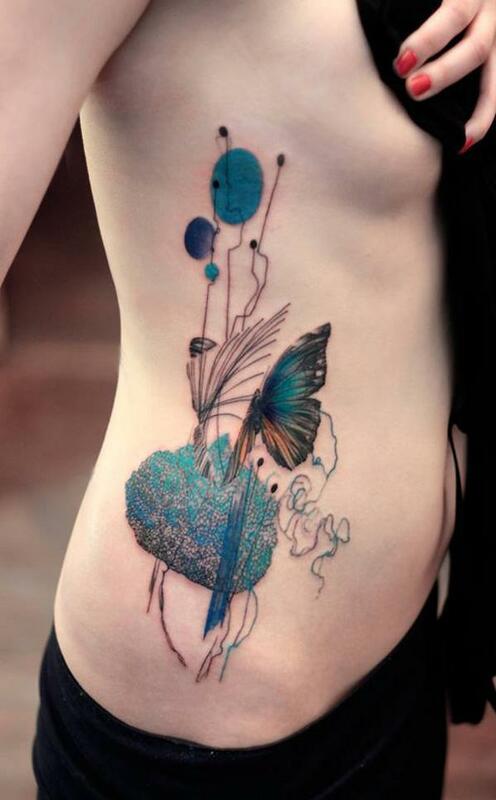 The abstract vibe could add life to your tattoo and make it look like an effortless thing of beauty. Whether a dedication to a person in your life or simply a praise of beauty, portrait tattoos will never go out of style. Adding the watercolor effect could make it glorious on a different level. 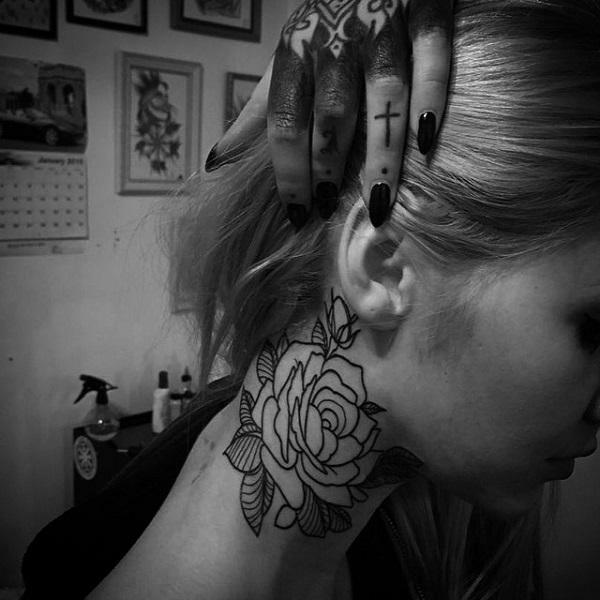 Flower tattoos could have different meanings depending on the culture of your place. For example in Japan, it’s commonly a design for the most prominent. The meaning of your tattoo could also differ according to the kind of flower you picked for the design. Another alternative to the abstract girl dancing is the watercolor style. 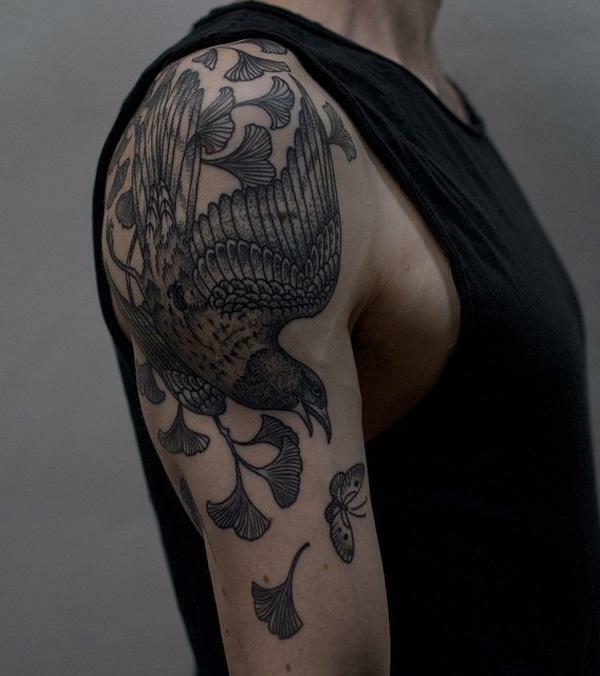 This one smaller which makes it perfect for a side tattoo and is much more milder and graceful. 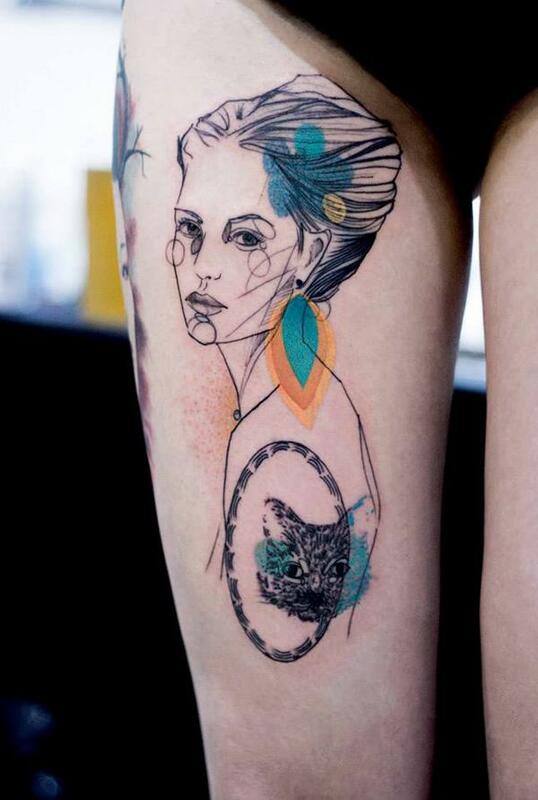 Tattooist Doy is known for his delicate styles. 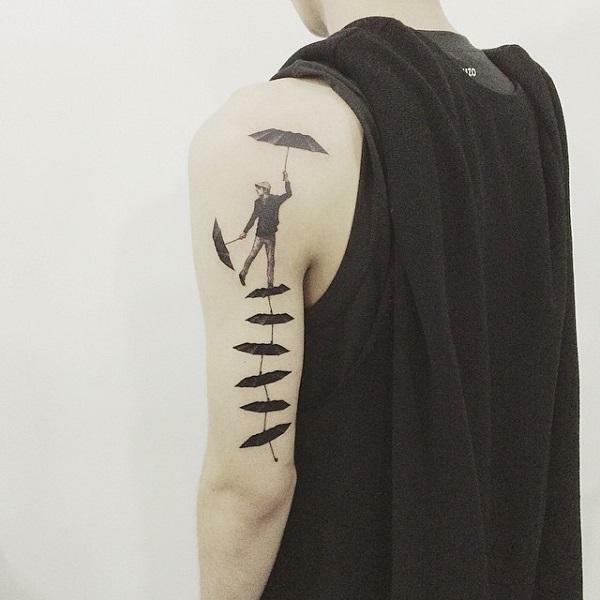 This tattoo is one of the perfect designs to show that off where a man is balancing on a stack of umbrellas. You can take note of the intricate details of the from the face to the shadowing of the umbrellas. 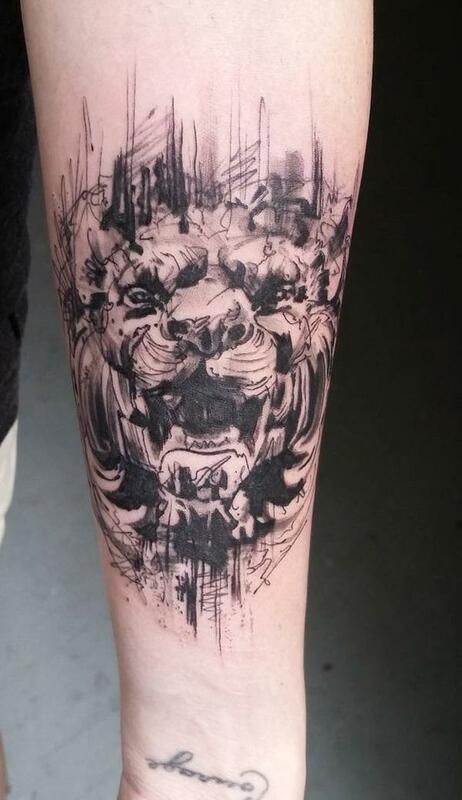 If you’re tired of the hyper realistic tiger tattoos, a surrealized design should fit you. It may look sketchy but it only adds to its charm. It even looks fiercer and much more powerful and be an impeccable symbol of your own strength. 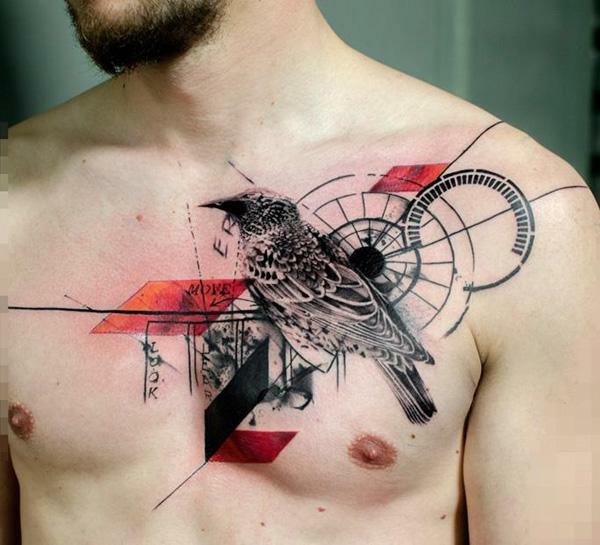 A strong looking 3D bird in a surreal geometric design may just be what you need when you’re looking for a tattoo that can describe your inner strength and ability to . 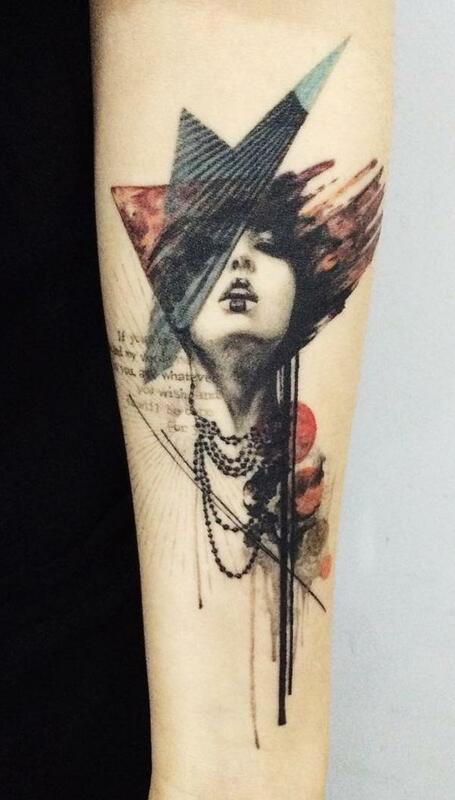 The details in this black, red and orange tattoo looks incredibly on point. It’s mystical and mysterious. This surreal fox head with a galaxy will make you feel like you’re in a dream. You can see skull tattoos on the majority of inked people. 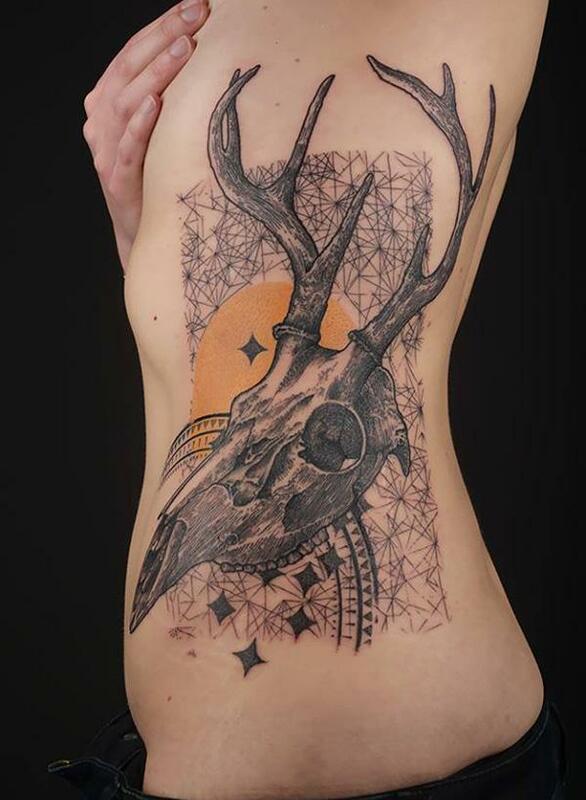 Besides being oddly pleasing and mystical, skull tattoos mean both life and death. It’s a message for everyone that we all live in the present but will have to face death in time. This tattoo can imply different things; from being unable to confess love and feelings to coming to a level of familiarity with your partner that you don’t need any words to explain what you mean. 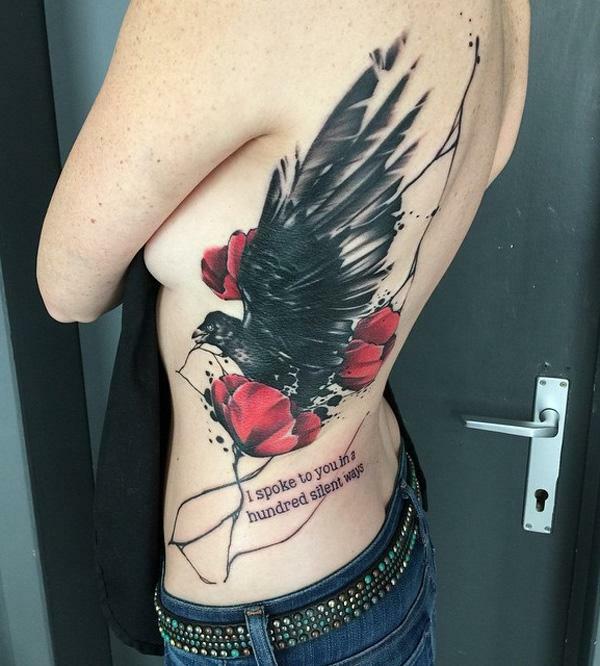 Whatever the indicated meaning you want, this tattoo is both romantic and strong. Scarabs were prominent features on Ancient Egyptian art and hieroglyphics. It’s deemed as sacred during those times. 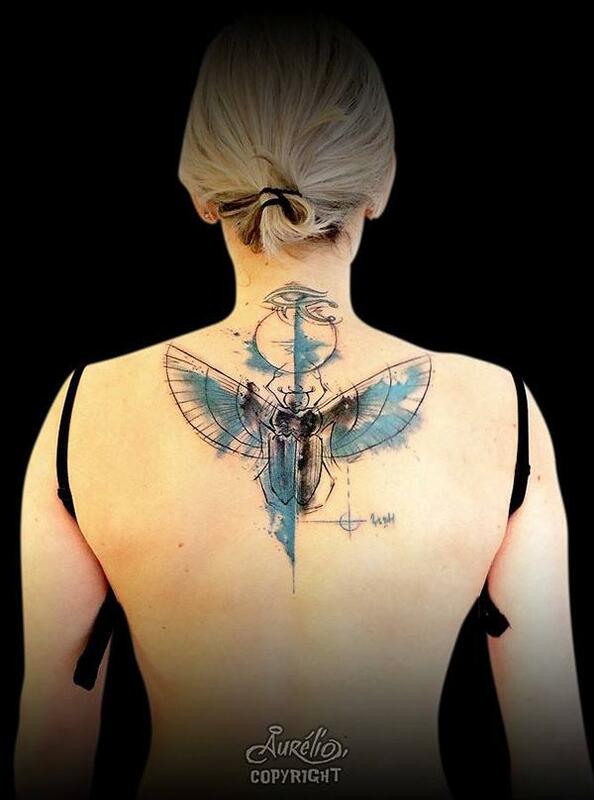 Up until now, scarabs have are popular in the tattoo business. Roses are commonly connected to love and being in love. It goes the same with tattoos. Having it on the neck could even give it a more sentimental and intimate kind of love. A praying woman as a tattoo could mean faith and could be a sign of your own. 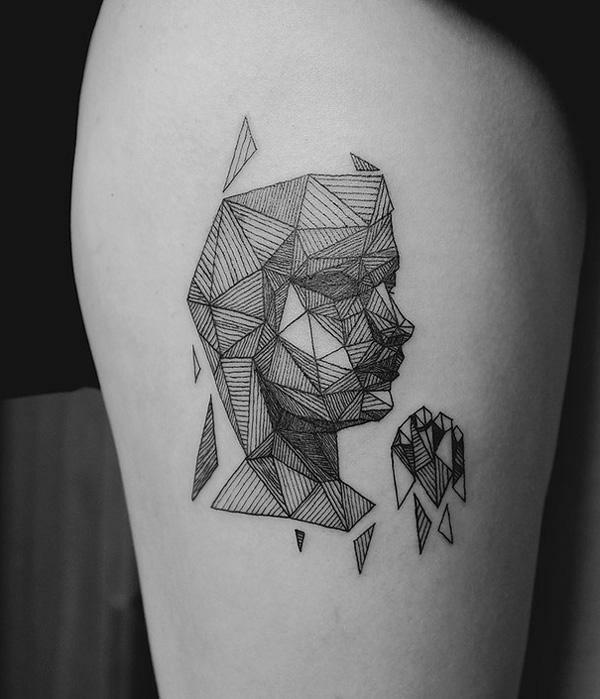 The geometric design makes it an even more mesmerizing piece of art worthy of being permanently inked in your body. If you’re looking for a bizarre yet wonderful portrait for a tattoo design, this one suits you well. 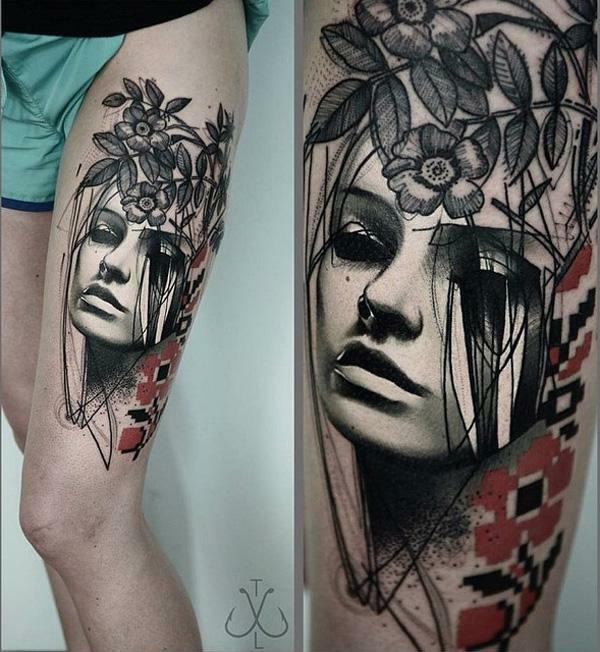 It’s a 3D portrait of a woman with half her face randomly sketched on and pixelated flowers. The random lines across her face looks more gothic and beautiful. Peonies are more common subjects on Japanese and Chinese art. 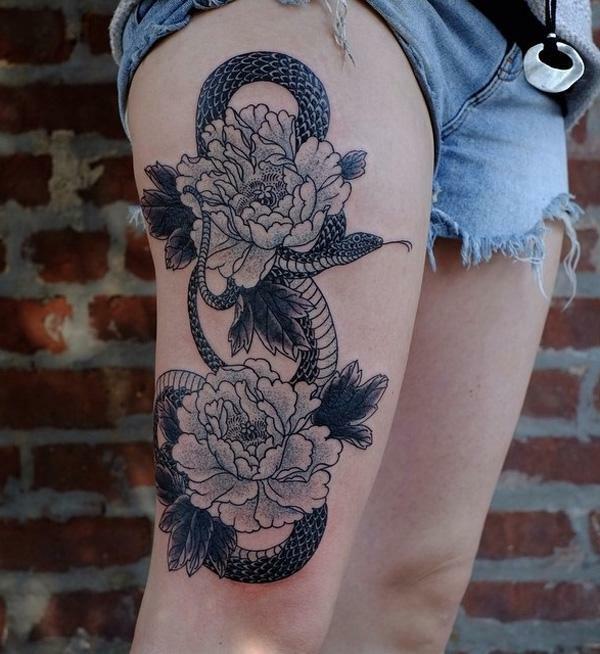 It’s delicate and beautiful and the additional details of the snake makes it an amazing black and white art. Owls are often a symbol of wisdom and knowledge. 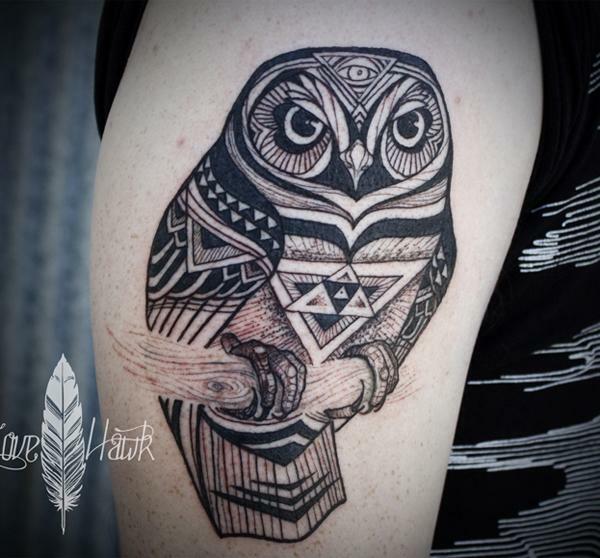 Adding different symbols to recreate your owl will turn heads when you walk on the street with this on your sleeve. 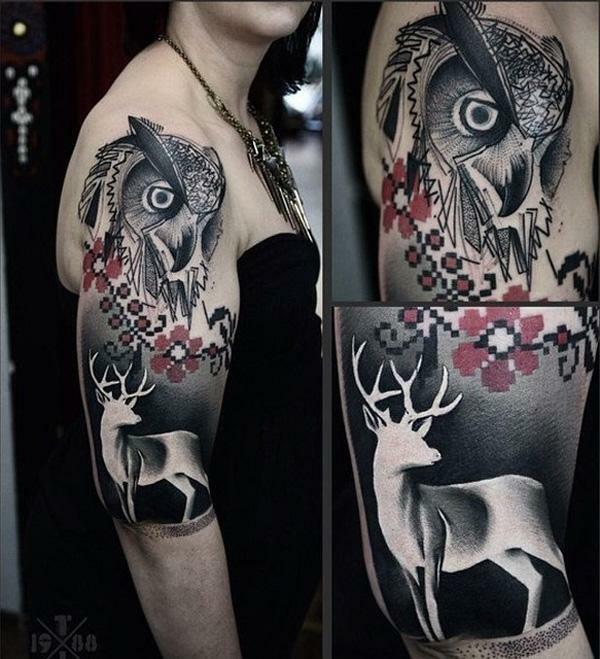 Adding a deer to your owl tattoo would magnify your symbolism for intelligence and wisdom as a deer could also represent that. 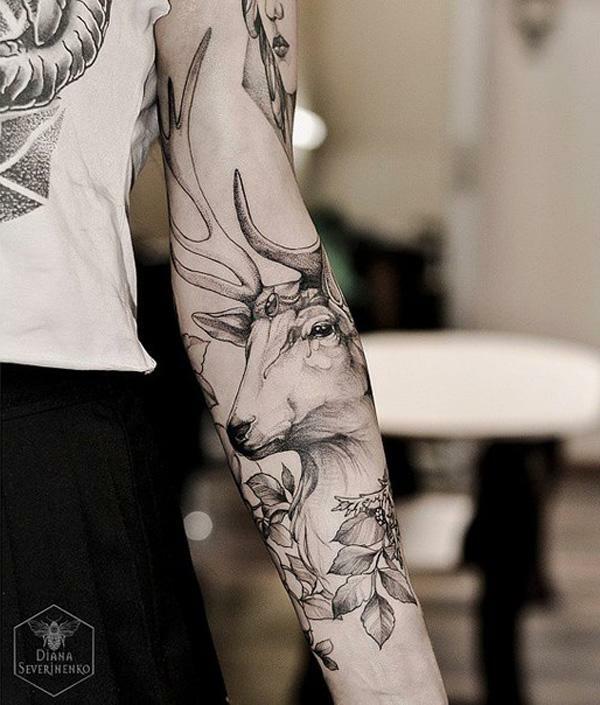 The 3D effect of the deer also makes it worthy of being placed where everyone can see it. 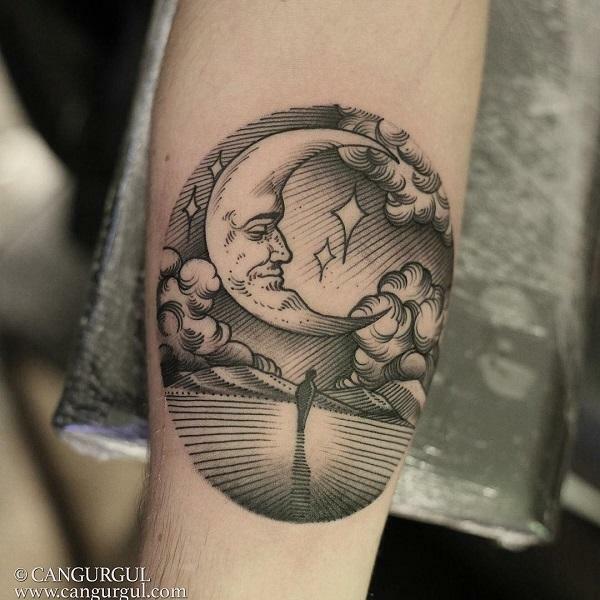 This surreal moon tattoo is more than just a dreamy design. Moon symbols often explore indications of mystery, luminescence, subtle strength and even fertility. A roaring tiger on your sleeve could easily depict who you are: strong, courageous and brave. Merging it with a lotus flower tattoo on the other hand could signify your purity. Here is a beautiful illustration of a modern beauty. 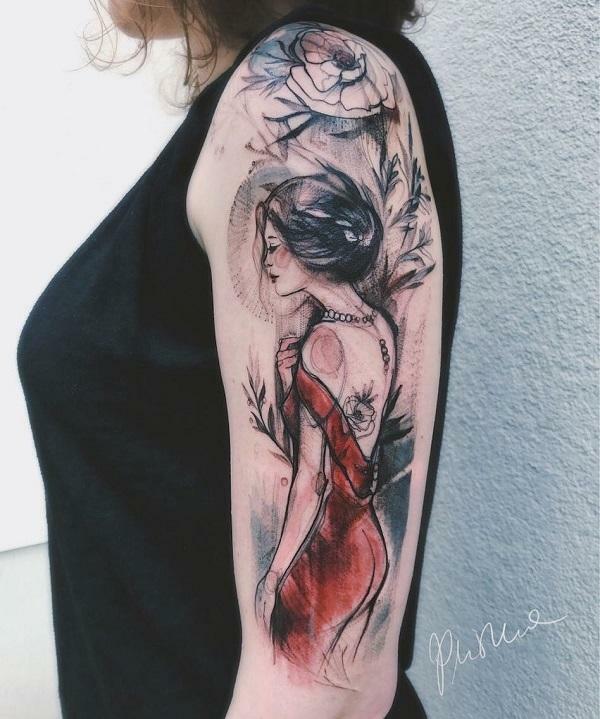 This one could be a praise for a woman’s grace and allure, wonderfully captured in this tattoo design. 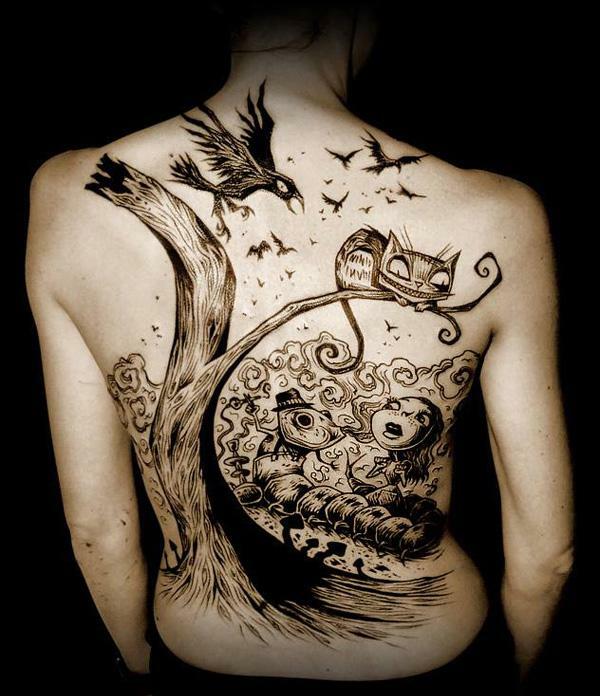 This surreal Alice in Wonderland tattoo is perfect for your entire back, almost like a page in a story book. More than that, it could be your way of representing active imagination and wonder. This simple tattoo design is what you need when you need a clean and subtle tattoo. It can also hold a symbolic value to you such as staying grounded and being humble or even as to hope and achieving goals. Ginkgo trees are sturdy and its leaves may very well be a means to relay a message that you are, too. You are tough and strong which is also represented by the bird in this design. Have it as a message for yourself as well so whenever you see your tattoo, you are reminded you can do it. 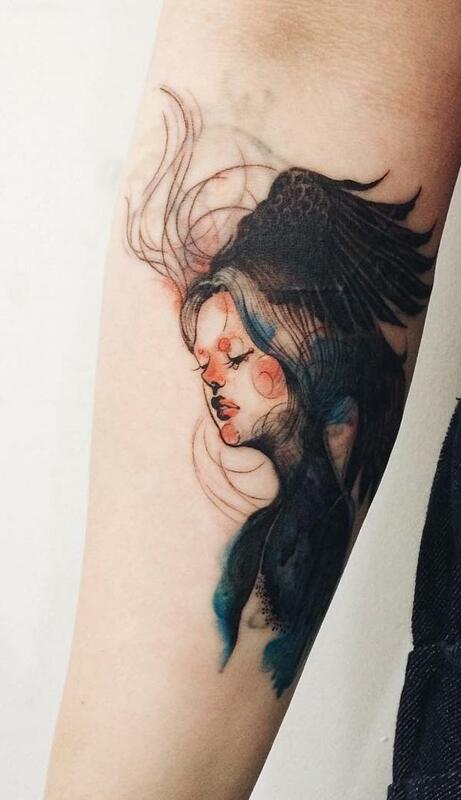 This sleeve tattoo could work with both men and women. The meanings could differ depending on the flower that you choose for your design. There are symbols for love, wealth, gentleness and purity among others. 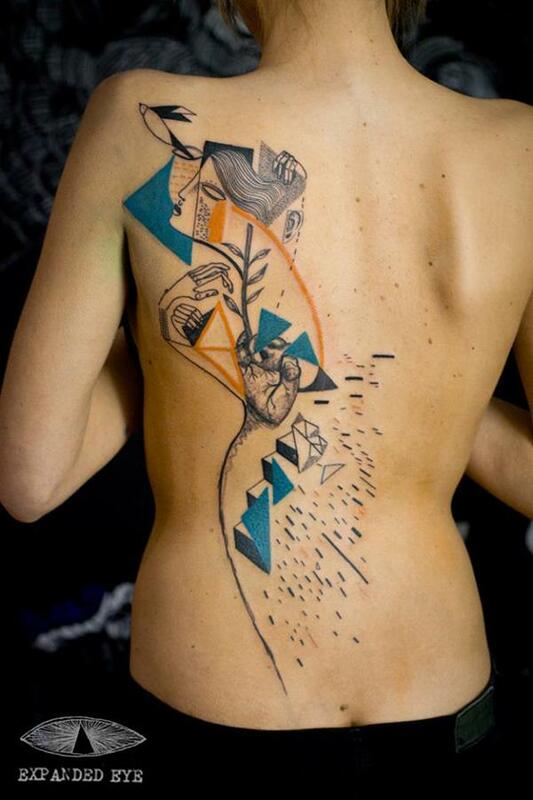 This is an example of an abstract tattoo that you can put on your back and even extend to both your arms. It’s definitely artistic and pleasing to the eyes. 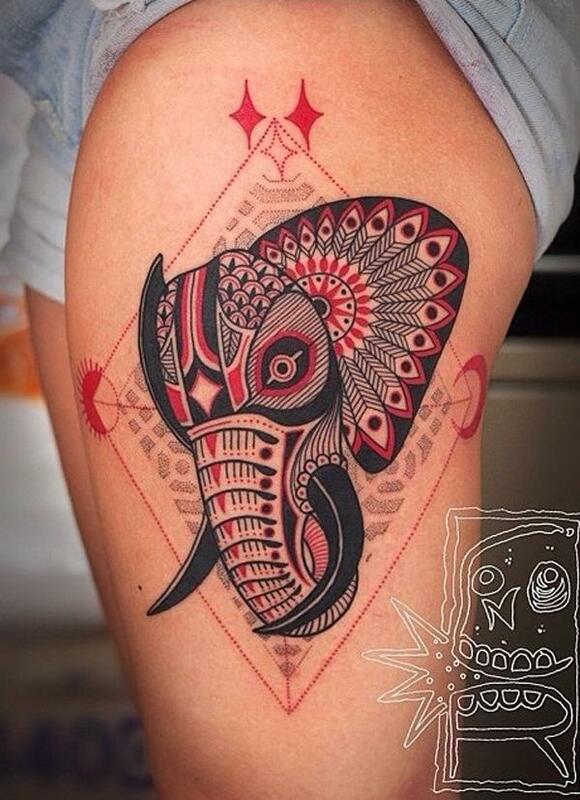 Elephants are symbolic to cultures of a lot of countries especially in Asia and Africa. You can show its strong and powerful attributes or have its natural peaceful and endearing nature. You can decide what the message is behind your tattoo. 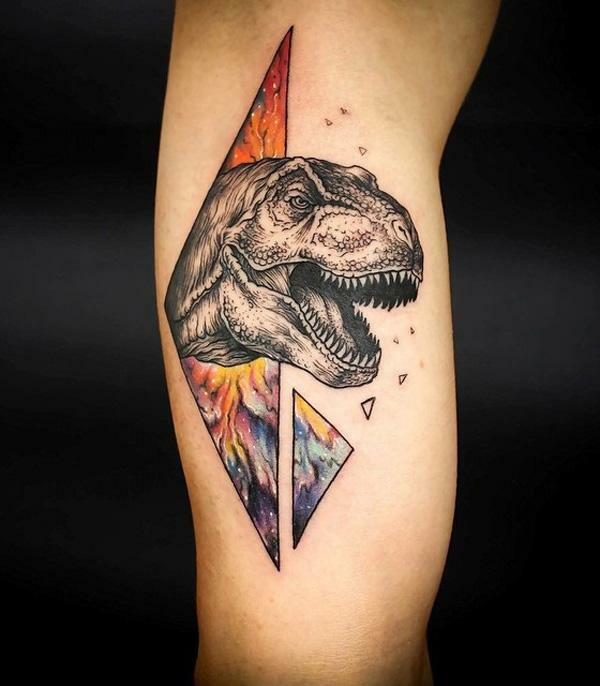 This colorful 3D dinosaur design is perfect for sci-fi fans. Would likely remind you of Jurassic Park movie franchise or perhaps those old comic books you had before. What do you have up your sleeve? How about this magnificent representation of a deer. Calming and soothing to the eyes. 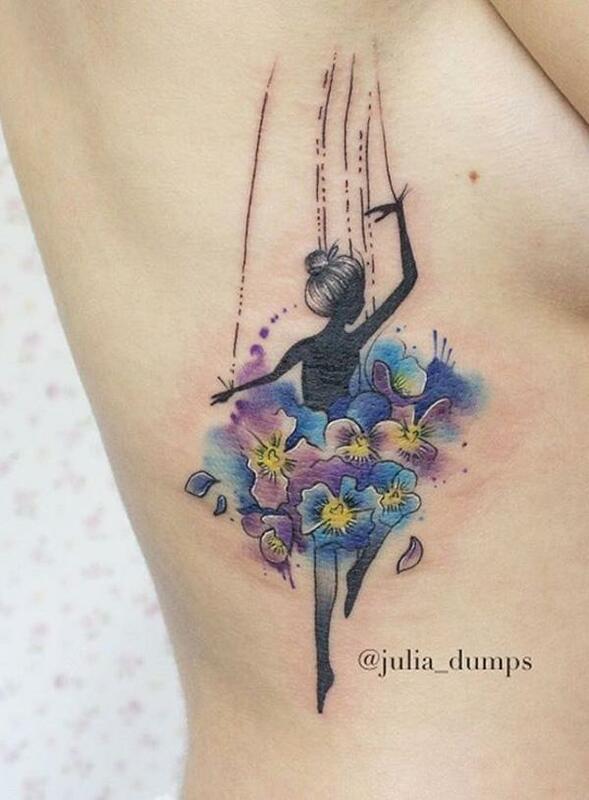 The colors on this 3D tattoos makes the design pop. Powerful and freedom. 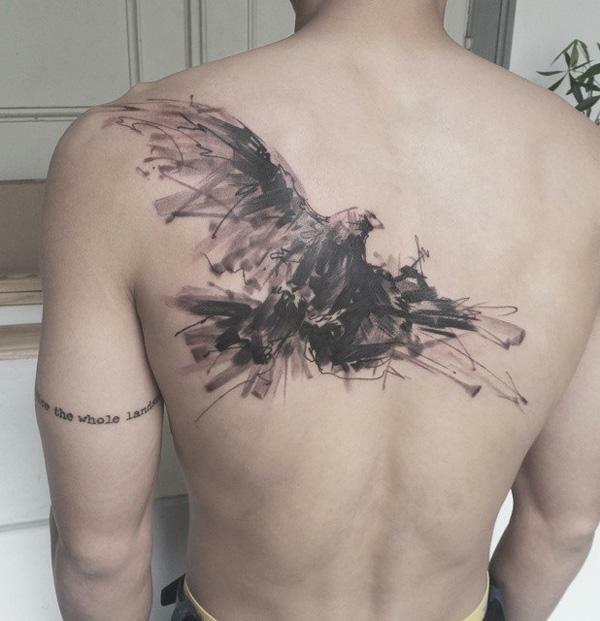 This bird tattoo speaks loudly these two words. The Chinese ink painting style only adds life to the design. I really want to get a tattoo, but I don’t want to just get any regular one. 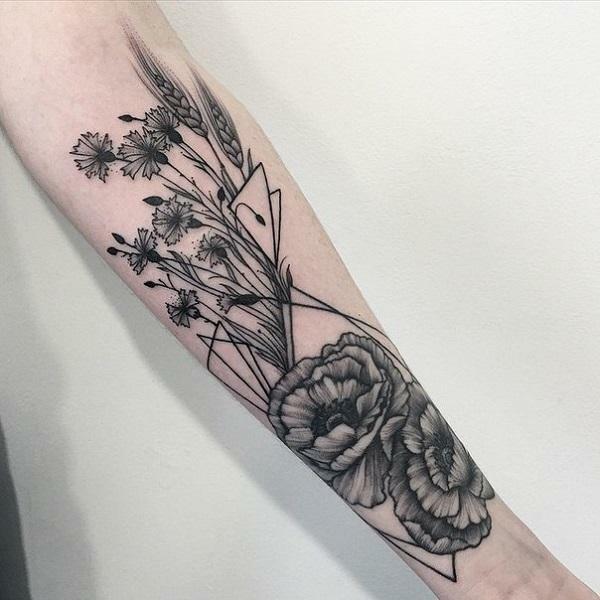 I want my tattoo to be unique and I am so happy that I was able to come across this post, because I am definitely inspired and am coming to realize what type I want to get. After looking through all 40 of these designs, I think that I really like the surreal style and know that I would want mine to be of that style. Watercolor tats shown here are beautiful. 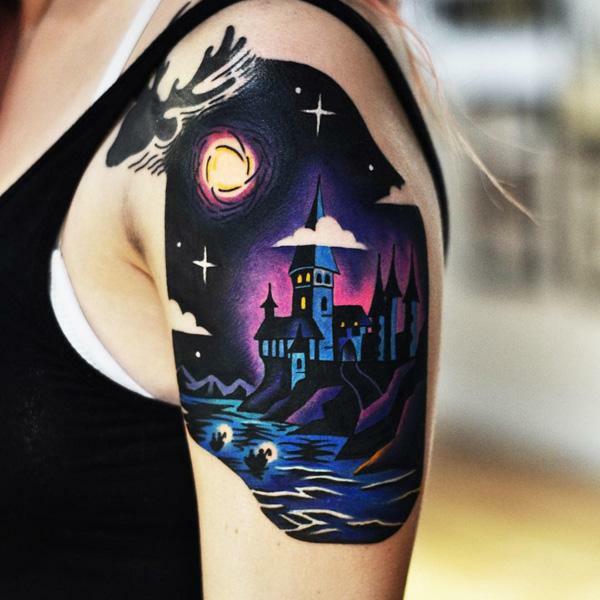 Beach night half sleeve tattoo is definitely a scene from Harry Potter. Beautiful nonetheless.